Pet Medical Center is a full service AAHA accredited animal hospital proudly serving Harker Heights, Killeen, Copperas Cove, Fort Hood, Nolanville, Belton, Temple and the surrounding communities! Pet Medical Center welcomes emergency treatment cases as well as pet patients in need of routine medical, surgical, and dental care. We have years of experience treating serious conditions and offering regular pet wellness care. Our goal is to treat your pet as if they were our own. We are also proud to offer alternative and complementary care to include animal chiropractic care, acupuncture, and laser therapy. 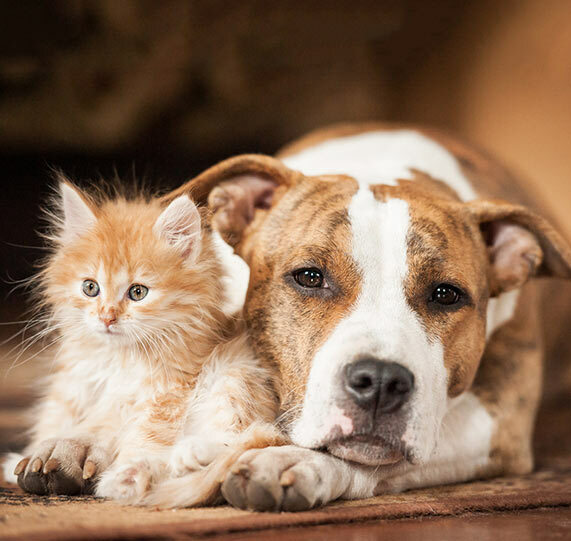 We utilize breed specific health care to make recommendations for your pet based on their breed and age and we have Fear Free certified staff that can work with you and your pet to promote a happier veterinary visit with less fear, anxiety and stress. We are happy to offer a number of resources that enable you to learn about how to take better care of your pets. Please feel free to browse our site, particularly the informational links, videos and handouts. We believe that preventative health care and quality nutrition are the keys to good health, and we want to team with you to develop the best personalized plan for your pet. If you have any questions, call 254-690-6769 or email us at [email protected] and we'll promptly get back to you. Our office is very easy to get to -- and you can find directions on our Contact Us page! Log onto your patient portal or create an account. We now offer online appointment scheduling! Book an appointment today. Use our mobile app to book appointments, check your pets’ reminders, and more! "Absolutely LOVE this place. The staff and drs are so great, caring and thoughtful. Absolutely would recommend them to anyone wanting great care for their fur babies." "Have a dog or cat or reptile? This is the office you want to take your babies to! Everyone in the office LOVES pets! My babies love PMC!" "I love the staff and the care we received several times from pet medical center… I will never go anywhere else again! Thank you Dr. Jones!" "I have two dogs and a cat and service is excellent. Doctors and staff are friendly and professional." "This is by far the BEST VET I have ever taken my fur babies too!" "I LOVE Pet Medical Center! You all are so caring and pleasant and such wonderful people! Dr. Jones is my favorite Veterinarian, and the others I have seen are also very good." "The best pet hospital in central Texas by far. They took such great care of my Nahla during her surgery and she is healing well. Great Staff!" "The experience we have encountered has been like no other....Thanks for your warm Welcome since we are new to the area from day one of our visits the staff has been very friendly and accommodating. Thanks Pet Medical!!!!!!!" "Everyone was very nice and took great care of Chopper. Thank you"
"We are completely satisfied with the care for our pets. Without Dr Ortiz we would've lost our Harley months ago." "Great bunch of people. Always very satisfied with my experience and they take great care of the pets." "Pet Medical Center is great. I trust them completely with my babies." "I really appreciate all you do for Mr. Teddy and I - thank you for supporting my little family!" "Pet medical is a wonderful place. Wouldn't take my dogs anywhere else!" "Staff are always professional and courteous." "Love the Pet Medical Center family"
"They answered all my questions & I highly recommend Pet Medical Center"
"The staff was truly professional. I really [like] that my dog will receive the best health care Pet Medical Center. A very friendly environment"
"I thought pricing was reasonable and I wasn't upsold on anything and I will refer friends and colleagues." "Great, friendly staff that seems genuinely happy to see my dog!" "We had a great visit"
"Wouldn't take my dogs anywhere else!" "It was great. Love the picture you took of my pet. Made it more personal"
"You always take great care of our babies." "Best Vet and staff in Central Texas!!" "All go out of their personal and professional way to assist and service."